People in Great Britain share different attitudes when it comes to spending and saving habits. It may be surprising, but it’s Scotland. 21% of Scots say they had over £30,000 in savings – a greater percentage than any other region of the UK. In comparison, just 14% of Londoners said they had as much saved up. So how are the Scots doing so well with saving money? The survey also asked “Do you generally keep track of your spending?” and we certainly saw a trend between this and average amount of money saved. The Scots came out top, with 59% replying “yes, all the time”, whereas Northern Ireland came second to last, with 16% saying they kept no track at all of their outgoings. Another great saving tactic is to stick to a budget and add to your savings every month. 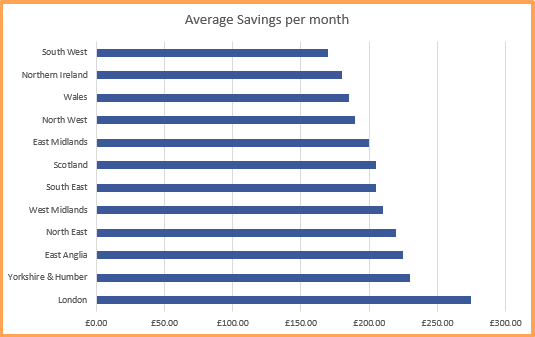 East Anglia was the most likely to never go over budget (33%) and the most likely to put money away every month (37%), putting them in a cool second place for most savings. London residents are managing to put away £269.07 a month – that’s £61.55 more a month than the average for the rest of the country. However, we can see from the graph, Londoners aren’t managing to hold onto as much of their extra cash as other regions. Perhaps that’s because over 20% of Londoners admitted to turning a blind eye to their finances. It doesn’t help that Londoners have so many credit cards, with an average of two per person. Over a quarter of respondents said they had between three and four! Londoners were also most likely to regularly eat into their savings and to spend money whether or not they had enough. Perhaps that’s just the nature of London life? Its’ clear that the UK’s spending and saving habits are extremely different across the landscape. Furthermore, the national average income can really do with a boost. That’s where Profit Squirrel comes in. You can easily earn and save £500 extra per month, tax-free. It will make a huge difference to the national average savings and spending – Is it time you lived comfortably? Join Profit Squirrel for free today. Sources: Lending Stream UK, Highcarts.